It is really important to stretch regularly to help develop flexibility and maintain muscles at their optimum length which can help prevent injury and muscle pain. For example a tight hamstring can sometimes be a contributing factor in back pain. There are a variety of different types of stretching dependent on whether you are warming up before training or an event or cooling down. 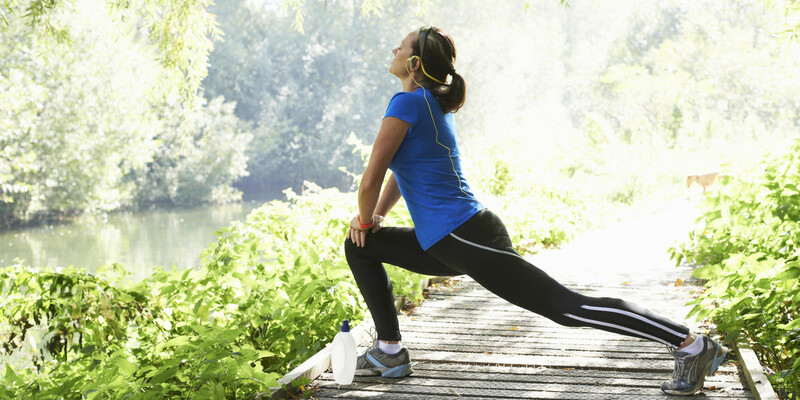 The two key types are Dynamic Stretching which is usually done to warm up before an activity and Static Stretching which is usually done post activity. Dynamic stretching helps increase blood flow and increases range of motion and Static stretching helps muscles relax and helps to realign muscle fibres. Chances are you don’t get many opportunities to stretch. If you have a desk-job, or spend lots of time in fairly static positions your body could do with a good stretch every once in a while. It will help loosen all the imbalances and muscle tightening that might be occurring from spending 8 hours a day hunched over a computer or driving long distances. Stretching is best done when your muscles are warm and supple and therefore is best done after your walk, run, exercise class or event. Below are some key stretches for the key muscle groups. Ensure that you hold each stretch for at least 30-40 seconds, and ideally up to one minute. How to do it: Come onto your hands and knees with hands directly below your shoulders and knees directly below your hips. Spread your fingers wide and tuck your toes under. This stretch improves flexibility in the hips and quads and helps release the hip flexors. How to do it: Come onto both knees and step your right foot forward. Make sure to keep both hips facing forward and glutes are engaged. This stretch helps improve flexibility in the hips and glutes. How to do it: Lie on your back, bend both knees, and bring your left ankle over your right thigh. This stretch helps lengthen and realign the spine and also increases flexibility in the lower back and hips. How to do it: Lie on your back and bring both knees in toward your chest. When changing sides make sure to use your core muscles to bring your legs back to center.